I’m sure that most of you saw the article in T magazine this weekend about the new book Howard Slatkin’s Fifth Avenue Style. The book features pictures of Slatkin’s Fifth Avenue apartment, which he painstakingly renovated and decorated. The book features a number of beautiful table settings, and a truly fascinating section on the service rooms in the apartment. After last week’s posts on china cabinets and china rooms, as well as some of the service rooms at The Breakers in Newport, I’m sure you can understand that I was extremely interested in this particular section of Slatkin’s book. Slatkin’s apartment features a silver cabinet, a flower room, and a candle room. Now I would never have thought about installing a candle room in an apartment, however, Slatkin’s brother and sister in law founded the candle company Nest – so it makes sense that he has an overabundance of candles to store. Here is the silver closet. Slatkin has lined every shelf of the closet with tarnish resistant fabric, which minimizes the need to polish before every use. Not only do I absolutely love the cabinet – but look at all his beautiful silver. The flower room. Slatkin believes that having a dedicated flower room is a “great convenience.” He enjoys being out of the way of the kitchen and having everything that he needs for arranging at his fingertips. On the inside door of the flower room, Slatkin has a board on which he posts pictures of past arrangements he has made that he felt were successful so that he can be inspired while he is arranging flowers. I think this is a great idea. 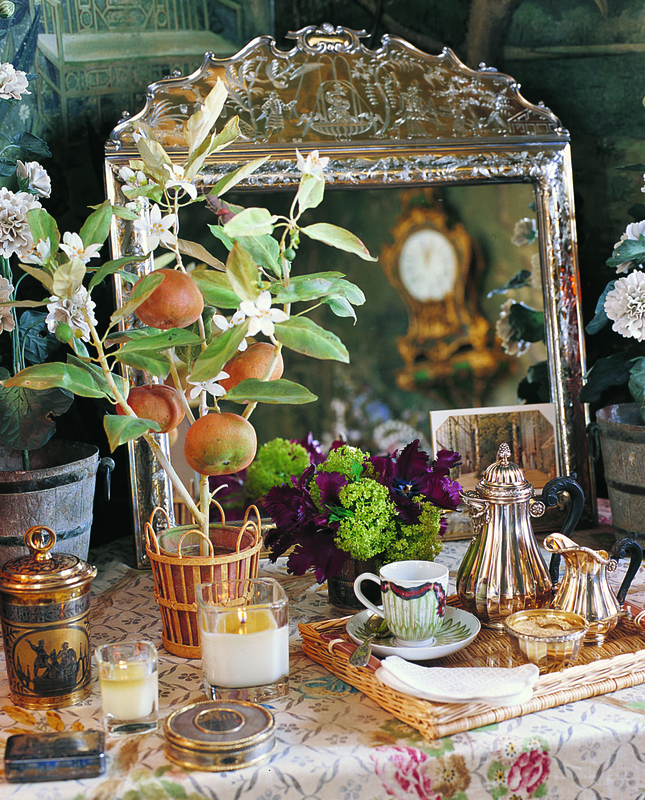 Slatkin does this both with flower arrangements and table settings … I may have to follow his lead on that one. Howard – I am so flattered that you read my blog, because your work is a source of inspiration to me! I have thoroughly enjoyed reading your book, and I am so glad that you enjoyed the post. Thank you! O.